I have seen this graphic here and there on the Internet. 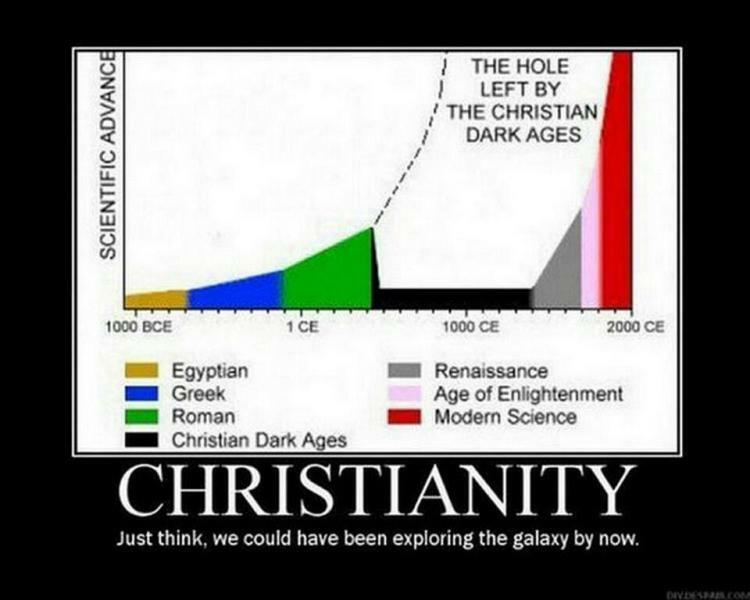 The atheist blog where I stole that particular image provides an explanation of the Christian Dark Ages. I am sure you have heard of the Dark Ages, but if not I’ll help you out. This was when, basically, science was outlawed, to the extent that if you were doing something that the church deemed blasphemous you were killed. This is when we hunted for witches because the bible says to kill witches, homosexuals, those who commit adultery, and the list goes on. If you were not a believer in god you were killed. In addition this was also the time when the Crusades were going on. So we were killing both our own people and the people of other nations in the name of god. Following god’s laws was one of the worst times in history (IMO). The infamous times you call the Dark Ages were an era of intelligence on strike, when men of ability went underground and lived undiscovered, studying in secret, and died, destroying the works of their mind, when only a few of the bravest martyrs remained to keep the human race alive. Every period ruled by mystics was an era of stagnation and want, when most men were on strike against existence, working for less than their barest survival, leaving nothing but scraps for their rulers to loot, refusing to think, to venture, to produce, when the ultimate collector of their profits and the final authority on truth or error was the whim of some gilded degenerate sanctioned as superior to reason by divine right and by grace of a club. Is any of this true? Were the Middle Ages a period of Darkness in which religious fanatics ran amok, science was a crime punishable by death, and men of intelligence went on strike? Well, no. The idea that there was a thousand-year period of poverty, ignorance and stagnation caused by fanatic Christians who were opposed to any sort of intellectual endeavor is the result of a dramatic oversimplification of Medieval history and anti-Christian bigotry. It is simply not the truth. There are not many historians nowadays who would fell comfortable labeling any period of the Middle Ages as the Dark Ages. This is not simply due to political correctness, but an acknowledgement that the period from around AD 500-1500 in European history was too complex and diverse to be so simply labeled. There were indeed times and places in that period of history that were very dark, but there were also very bright times and places which attained a very highly developed civilization. Any two word phrase simply cannot do justice to the vast sweep of Medieval European History. In general, historians divide the Middle Ages into the Early Middle Ages, from around 500-1000, the High Middle Ages, from around 1000-1350, and the Late Middle Ages, from around 1350-1500. I will ignore the Late Middle Ages since that period of time is usually referred to as the Renaissance, except to say that there was a sort of mini-dark age in the wake of the Black Death of 1349 and the general breakdown of Medieval institutions throughout the fourteenth fifteenth century. I have already dealt with the Scholastic philosopher-theologians of the High Middle Ages and the important role they played in paving the way for the development of modern science. The High Middle Ages were the period in which the university was developed. European scholars gained access to ancient texts in Greek, and Arabic. The population throughout Europe increased dramatically. More lands were cleared for settlement. Long distance trade expanded and modern banking and capitalism began to develop. Politically, this was the age in which nationalism began to develop and European states began to be more centralized and more efficiently governed. This was also an age in which the city states of Italy and norther Europe could flourish. Culturally, new movements in art and architecture began and literature began to be written in vernacular languages. The High Middle Ages saw an increase in religious devotion, along with the intellectual ferment, which should put to rest the idea that Christian piety and science are forever at odds. The Dominican and Franciscan monastic orders were introduced and there was an increase in religious activity among the laity which foreshadowed the Protestant Reformation. Among the new technologies either invented by Europeans or introduced to Europe were paper making, the magnetic compass, eyeglasses, the wind mill, the spinning wheel, the first mechanical clock, gunpowder and Arabic numerals, along with the re-introduction of the abacus. Even the Crusades were a positive development. 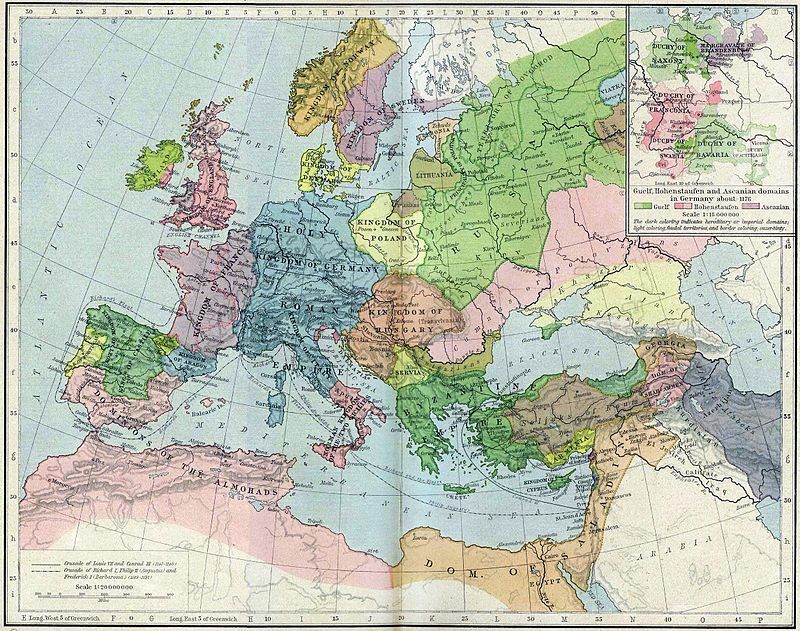 As we will see, the Early Middle Ages was a period in which Europe was continually invaded from without. The Crusades were not just the result of mindless religious fanaticism, in which Christian barbarians slaughtered anyone who worshiped the wrong god. The Crusades were an attempt by the nations of Christendom to go on the offensive against enemies who had been threatening them for centuries. Transporting armies across a continent and defeating the Moslims on their own ground took a considerable amount of wealth and preparation. The fact that the Crusaders were victorious in the First Crusade is an early indication that the Europeans were beginning to pull ahead in technology. The High Middle Ages were not a Dark Age by any means. Instead, the High Middle Ages must be counted among the most brilliant and dynamic in human history. We would not be where we are today if the High Middle Ages had really been the Christian Dark Ages. I had intended to take up the subject of the Early Middle Ages which could more justly be called a Dark Age but this post is getting long so I think the Early Middle Ages will have to have a post of its own.